I ain't gotta explain p*op! GURPS prides itself on being modular. There is more than one way to cast magic, and GURPS implements several and gives tools for creating others. Today I'm going to be dissecting a few of the more popular systems and hopefully give a fair shake with a respect to perceptions of balance, creating new spells, and mental strain during the game. Let's dive in. I don't know what else to call this; it is the default system for magic, sometimes called "spells as skills" which doesn't roll off the tongue so swell, and "default" sounds boring, so I call it Vanilla. The system is described in the GURPS Basic Set and in GURPS Magic, so if for whatever reason, you want to use this system, and somehow you don't have the basic set, you don't need it. Someone who wants to use Vanilla magic needs to buy the modestly priced Magery advantage, and then needs to buy spells. Spells in Vanilla behave like skills that are all IQ/Hard or IQ/Very Hard. Magery acts as a talent that adds to IQ for spell casting. Players are incentivized by the system to invest to skill levels with multiples of 5 because at each of these levels starting at 15, the player receives a discount. Overall, in terms of point investment, the vanilla system is probably the cheapest. 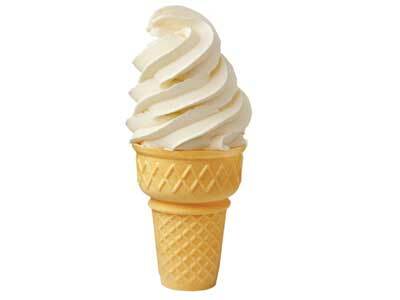 As opposed to some other systems, vanilla magic is balanced mostly by FP (or, similarly, Energy Reserve) expenditure. The spell system also has something of a prerequisite tree, so the highest tier spells require investment in several lower tier spells, however modest, but investment nonetheless. Additionally, some spells can take a very long time, making them prohibitive for GURPS combat which happens on an order of 1 second a turn. In short, Vanilla magic is balanced by stronger spells having longer casting times, higher energy requirements, and often times, many prerequisites. Vanilla spells are not incredibly complex in play, but potentially, more complex than others. Most are as simple to use as skills, but a few gotchas are present in the form of some ranged spells following different range rules (malediction ranges, versus nominal ranges, versus long distances) and some having scale-able effects based on energy consumed; eg, some light spells can create higher quality light with more energy; some attack spells can do more damage with more energy. 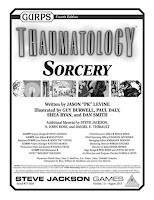 GURPS Thaumatology allows another layer of complexity in the form of enhancements which are techniques that add extra capabilities to spells with the trade-off of skill penalties and/or increased cost. 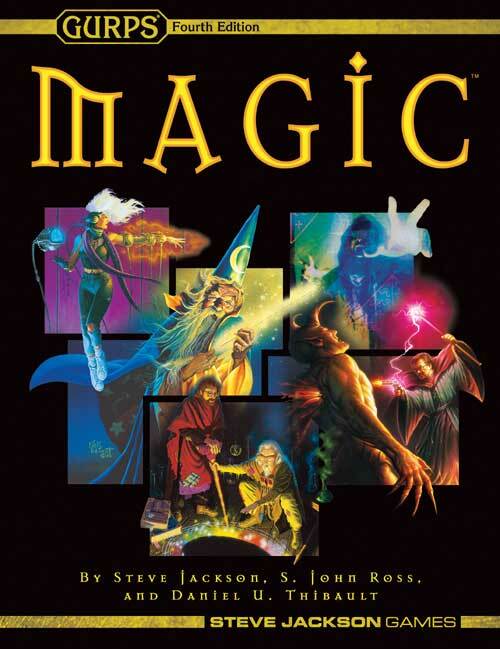 GURPS Basic Set has a short but serviceable list, and GURPS Magic has an incredibly detailed list of already written spells meaning this system almost works immediately out of the box. There are a few short supplements with even more spells if these are not enough. On the other hand, in contrast to the colossal list of already existent spells, there is some, but very sparse guidance on creating new spells. GURPS Magic on pp.14-15. This guidance doesn't even address all dimensions of the problem of defining a new spell, but it exists. Besides those two pages, the best most can hope to do is balance by comparison against the already long list of spells. 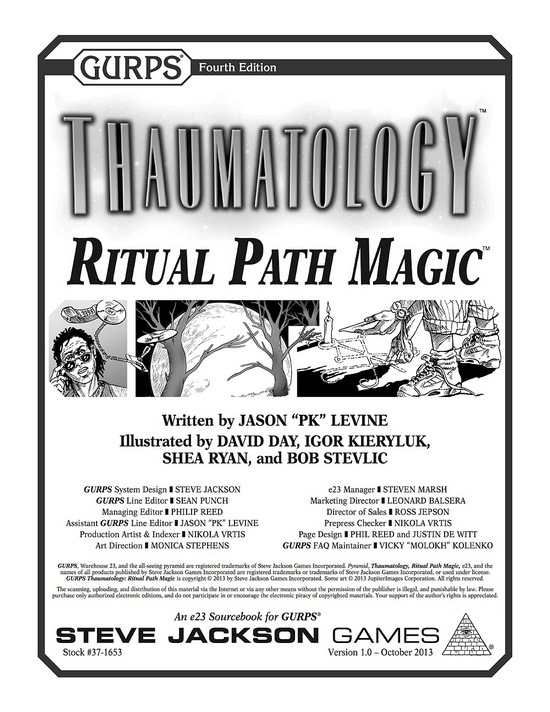 Ritual Path Magic, often RPM for short is a very flexible magic system that can potentially allow players to do anything they can think of. It requires lots of concentration and can come with heavy penalties though. Let's dive in. Characters need to buy magery, like with Vanilla magic. Unlike with vanilla magic, however, it isn't treated as a talent, only a cap on how high magic can go. 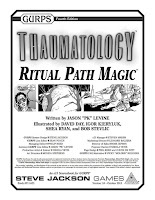 Players also need to invest in the difficult skill Thaumatology, another component of the cap, and then finally path skills. By default, casting magic is difficult and spells take on the order of minutes to hours, but with an expensive advantage, Ritual Adept, a player can change this to an order of seconds to minutes. Of the popular systems, Ritual Path Magic might be the most expensive Character Point wise, but also has a steep power curve, when you get to the summit of Mt. RPM, you are probably leagues beyond typical Sorcerors or Vanilla people of the same investment. RPM is mostly constrained by time, casting spells takes a very long time without steep penalties. Very powerful rituals are locked behind a wall of Greater Effects, a mechanic that has a multiplicative effect on the cost in energy for spells. There are a lot of situational modifiers to overcome this, like taking penalties to go faster, or sacrificing expensive objects for energy discounts. RPM probably has the highest degree of in-game complexity of the three popular systems because of its flexibility. It is a system that encourages being able to make spells on the spot and requires keeping running tabs of small numbers coming into large sums as energy is gathered. It has a combat critical charm mechanic that works just slightly differently than regular casting, but admittedly is easier. This charm mechanic allows creating time consuming spells in off time for nigh immediate use in emergencies like combat. The RPM default spell list is very small compared to the default vanilla magic system. 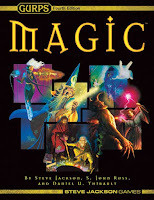 There are just over 10 pages of spells in the original book, compared to the multiple hundreds of pages for Magic. But, the big strength of the system is its ability for ad-hoc spell creation. A spell list is not absolutely necessary because spells are easy enough to create on the fly. There are also several fan repositories of spells on-line owing to it's popularity. The process can take a few minutes to work out even when experienced with the system though, so having a written "grimoire" and calculating costs offline is still recommended. 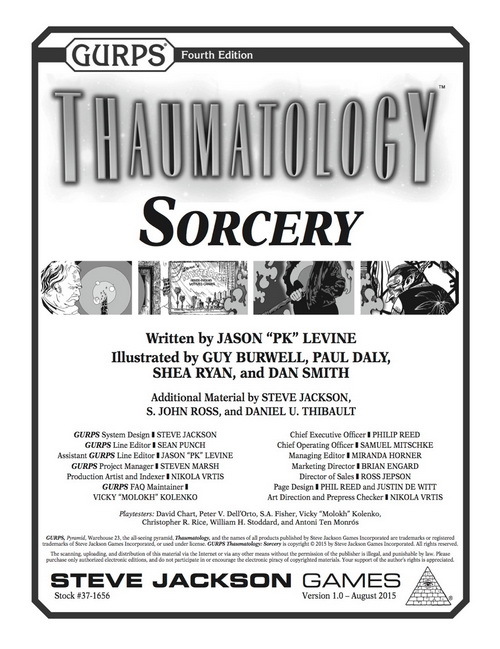 Sorcery, or "Powers-As-Magic" is a system that builds on already existing architecture in GURPS 4th edition with only a little bit extra on top of that. Each individual spell can be pricey in terms of character points, but they have the least hang-ups of either of the three systems; they are cheap and fast to use, and their only ceiling in power terms is how many character points you can spend on advantages. The foundation of Sorcery is magery again, and the sorcery talent. The Sorcery version of Magery is actually akin to a type of modular ability that allows casting very cheap spells with enough investment, or more expensive spells with steep skill penalties. The talent functions as a typical powers talent, and gives a bonus to skill rolls called for by spells. Finally each spell is a full fledged advantage, thus you pay more character points per individual ability than either of the vanilla system or RPM. Quite simply, Sorcery spells, as I've said are nearly no strings attached. They are generally to be designed to cost 1 energy and be cast within 1 second if manageable. The big balance factor for Sorcery is really taken into account with the cost of individual spells. As each spell is an advantage, they can cost 10s of character points each. Fortunately, even in this case, Sorcery takes advantage of the alternate advantage mechanic of GURPS to reduce the cost of each advantage. This leads to the other small balancing consideration: the fact that sorcery spells are alternate advantages means it is hard to take advantage of buffing spells as spells cannot be switched without being disabled. Sorcery is basically an application of Powers. Almost any created advantage can be converted into a sorcery with little change. So if you think of it in that manner, you already almost have a large spell list in the form of "every advantage and power ever made with one to few small adjustments." It also comes with a small grimoire close to comparable to the RPM one. The system for creating new spells in this way is covered in the Basic Set with a lot of extra help in Powers making it very easy to extend with new spells as well. I like all three of those spell systems, and it's hard to choose favorites. I like the huge list of spells for Vanilla, the flavor of RPM, and the ease of creation of new spells for Sorcery. These three are the super popular magic systems for GURPS, but I also want to compare some other honorable mentions in another article that also get a lot of talk time in the communities I frequent. I think next time I get an opportunity to play a magic character in GURPS, I might want to go for Sorcery. Great comparison! I think you're underestimating Sorcery's in-play complexity. If you only stick to your repertoire, then Sorcery is very simple. However, as soon as you start improvising, you need to calculate the cost of new powers on the fly and then compute your penalty for the improvisation. Since improvisation is one of the big selling points of Sorcery (you're not restricted to the powers you explicitly bought), that's a lot of crunch that appears in-game. I did account for it, but you might be right that I might have downplayed it a bit too much. I think the reason why I didn't think about it too much is I kinda glazed over it because Cantrips to me seem prohibitively expensive, but yeah, improvised casting isn't outside of the realm of possibility for a modest point investment. Get something like 4 levels of magery, and 4 levels of talent, and with a decent IQ, you can pretty reliably improvise some useful stuff. Keep in mind that allowing players to invent new spells in play is strictly optional. GMs are encouraged to come up with a list of known spells for the campaign, and restrict all improvisation to the spells on that list. If you choose not to do this, then that is your call. It isn't the fault of the system. Levine's intent with Sorcery was to create a system with minimal in-play complexity, where spells cast in play are normally drawn from a pre-determined list. It was meant to be the opposite of Ritual Path Magic in that regard. Is Powers not a magic system? It very easily can be! In fact, that is what Sorcery is. It lets you build up advantages like powers if that is your preferred system, but it also has a lot of thematic niceness and trappings that goes above and beyond just making advantages, like having improvisation and enchanting systems.